Whole Number Arithmetic (WNA) appears as the very first topic in school mathematics and establishes the foundation for later mathematical content. Without solid mastery of WNA, students may experience difficulties in learning fractions, ratio and proportion, and algebra. The challenge of students’ learning and mastery of fractions, decimals, ratio and proportion, and algebra is well documented. Most of this research has focused on either fractions, decimals, ratio and proportion, algebra, or WNA. There is a lack of research that addresses the connection between these relevant topics. Within WNA, most research focuses on counting, computation, or solving word problems. There is a lack of research that investigates connections within WNA. This special issue is intended to bridge this research gap by explicitly highlighting the conceptual knowledge of counting, calculations, and quantity relationships, as well as the structure of word problems within and beyond WNA. This study was funded by the research committee of the University of Macau, Macao, China [MYRG2015-00203-FED]. Bartolini Bussi, M. G. (2015). The number line: A “western” teaching aid. In X. Sun, B. Kaur, & J. Novotná, (Eds. ), Proceedings of the 23rd ICMI Study on ‘Primary mathematics study on whole numbers’. China, Macao: University of Macau, retrieved on February 20, 2016, from http://www.umac.mo/fed/ICMI23/proceedings.html. Bartolini Bussi, M. G., Sun, X. H., & Ramploud, A. (2013). A dialogue between cultures about task design for primary school. In C. Margolinas (Ed. 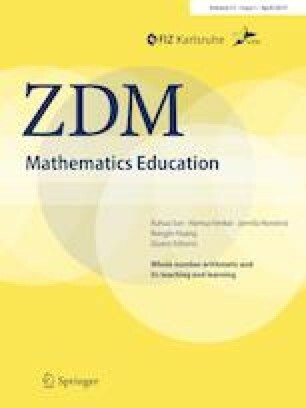 ), Proceedings of ICMI Study 22 on task design in mathematics education (pp. 409–418). Oxford, United Kingdom. Retrieved February 10, 2019 from https://hal.archives-ouvertes.fr/hal-00834054v3. Beckmann, S., Izsák, A., & Ölmez, I. B. (2015). From multiplication to proportional relationships.In X. Sun, B. Kaur, & J. Novotná (Eds. ), Proceedings of the 23rd ICMI Study ‘Primary Mathematics Study on Whole Numbers’. China, Macao: University of Macau, retrieved on February 20, 2016, from http://www.umac.mo/fed/ICMI23/proceedings.html. Kaur, B. (2015). The model method—A tool for representing and visualising relationships. In X. Sun, B. Kaur, & J. Novotná, (Eds. ), Proceedings of the 23rd ICMI Study on primary mathematics study on whole numbers. China, Macao: University of Macau, retrieved on February 20, 2016, from http://www.umac.mo/fed/ICMI23/proceedings.html. National Assessment of Educational Progress result, NEAP (2015). Retrieved March 15, 2018, from http://www.nationsreportcard.gov/reading_math_2015/#mathematics/acl?grade=4. Sun, X. H. (2015). Chinese core tradition to whole number arithmetic. In X. Sun,, B. Kaur, & J. Novotná, (Eds. ), Proceedings of the 23rd ICMI Study on primary mathematics study on whole numbers’ (pp. 140–148). China, Macao: University of Macau, retrieved on February 20, 2016, from http://www.umac.mo/fed/ICMI23/proceedings.html. Sun, X. H., Kaur, B., & Novotná, J. (Eds. )., (2015). Primary mathematics study on whole numbers: ICMI Study 23 Conference Proceedings, June 3–7, 2015 in Macau, China. University of Macau. Retrieved from http://www.umac.mo/fed/ICMI23/proceedings.html. Sun, X. H., Neto, T., & Ordóñez, L. (2013). Different features of task design associated with goals and pedagogies in Chinese and Portuguese textbooks: The case of addition and subtraction. In C. Margolinas (Ed. ), Proceedings of ICMI Study 22 on task design in mathematics education (pp. 409–418). Oxford, United Kingdom. Retrieved February 10 from https://hal.archives-ouvertes.fr/hal-00834054v3.